PETALING JAYA: The Bar Council wants the Government to amend the National Land Code to protect landowners and bona fide purchasers from losing or buying property through others' fraudulent actions. It wants Section 340 of the National Land Code and other relevant provisions to be amended, said the council's Conveyancing Practice Committee chairman Roger Tan. He said they had prepared a memorandum “Prevention and Protection Against Fraudulent Land Transactions” and would present it to the Natural Resources and Environment minister as soon as possible. Tan said this following a Court of Appeal decision on Friday which ruled that brothers Au Meng Nam and Ming Kong were the proprietors of a piece of land and not Ung Yak Chew who had purchased it from two fraudsters. The hearing, presided by Justice Gopal Sri Ram, also comprised Justices Md Raus Sharif and Hasan Lah. In the decision, the Court of Appeal declared that a controversial Federal Court judgment in a similar case in 2000 (Adorna Properties Sdn Bhd vs Boonsom Boonyanit) was wrongly decided. “Notwithstanding the Court of Appeal decision on Friday, the law must be amended, and the Government must do it as quickly as possible to reverse the decision of Adorna Properties. “This is in order to assuage the fears of landowners who now risk losing their properties to forgers and fraudsters,” Tan said. Among the council's reasons for amending the National Land Code was the fact that ownership of land was at risk because a landowner is legally not entitled to lodge a private caveat against any dealings on his land and that it was against the principles of fairness and justice that a landowner is without remedy or compensation for loss of land following the Adorna Properties decision. 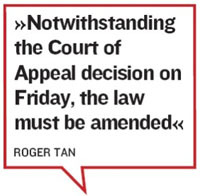 Tan added that even when Boonsom's personal representatives had asked the Federal Court to review its decision, the apex court , comprising of Justices P. S. Gill, Rahmah Hussein and Richard Malanjun, had reaffirmed the earlier decision, saying they were not convinced that the interpretation given in 2000 was patently wrong. “The only (other) way for courts to get around the Adorna Properties case, for example, is if they find that the purchaser who bought the property from forgers to be someone who is not a bona fide purchaser, as in Friday’s decision,” said Tan.